The .45 ACP. It’s been around since 1904 partly as a result of the rather infamous Thomas LaGarde Tests. It’s best known as the original and most popular chambering for the 1911 and is also trusted by many elite special forces including the U.S. Navy SEALs. Newcomers to the round are often surprised by its manageable recoil and minimal muzzle flash. 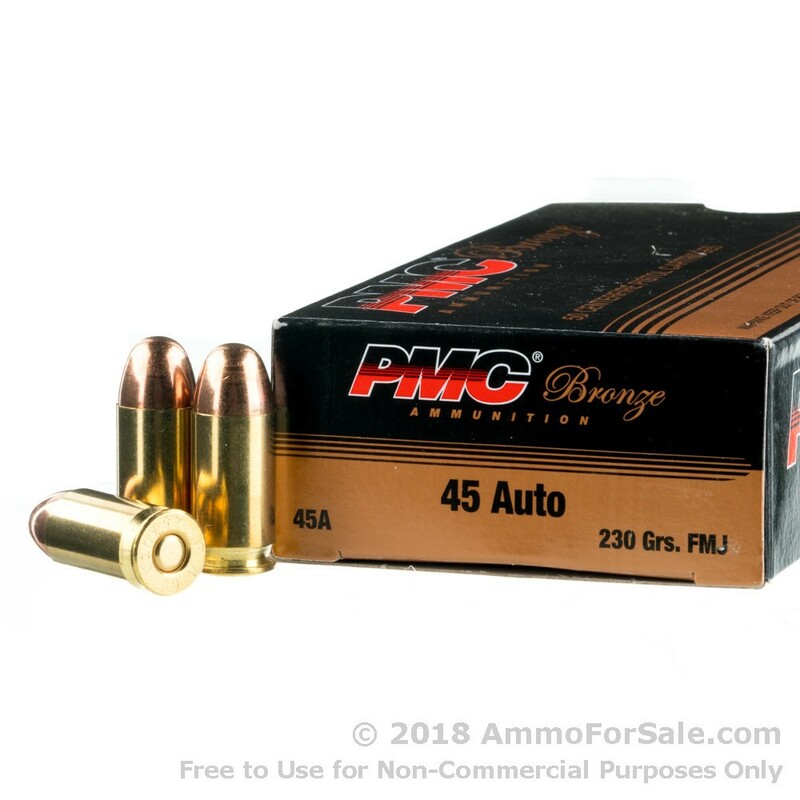 It’s an awesome cartridge, and if you have a gun chambered in .45 ACP chances are you’re looking for some good target rounds. 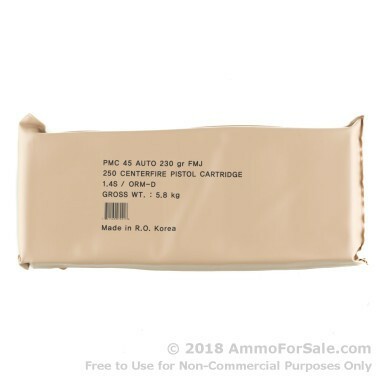 These .45 ACP rounds are manufactured by PMC (Precision Made Cartridge). Each round weighs in at a hefty 230 grain making these fairly heavy for the cartridge size. Being heavier enables these rounds to strike targets with a powerful impact. 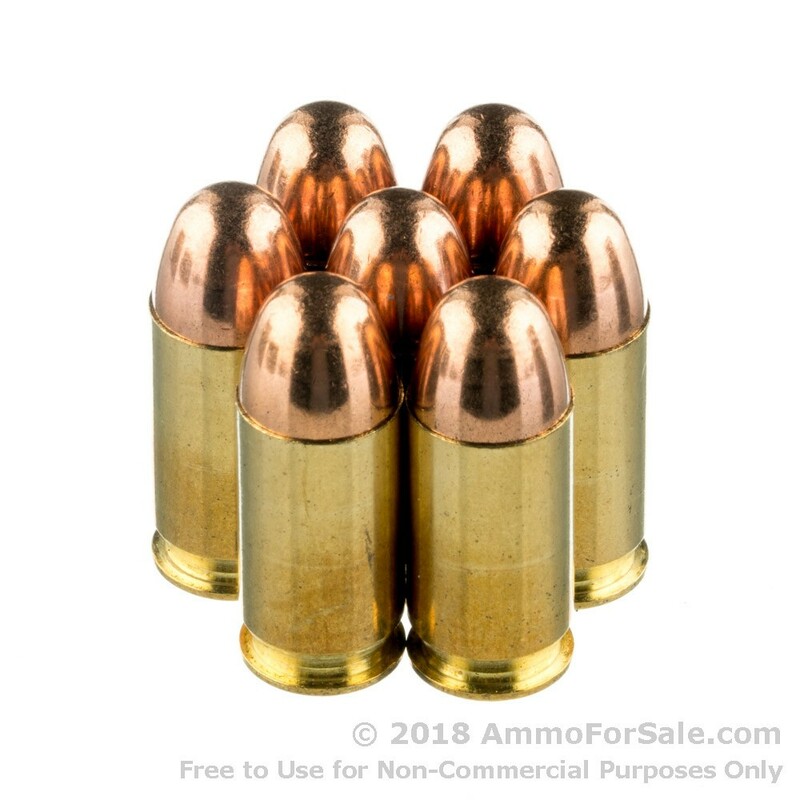 These are Full Metal Jacket, FMJ, rounds and do not expand on impact. Target rounds are prone to over-penetration so be sure you have a reliable backstop in place during range time. 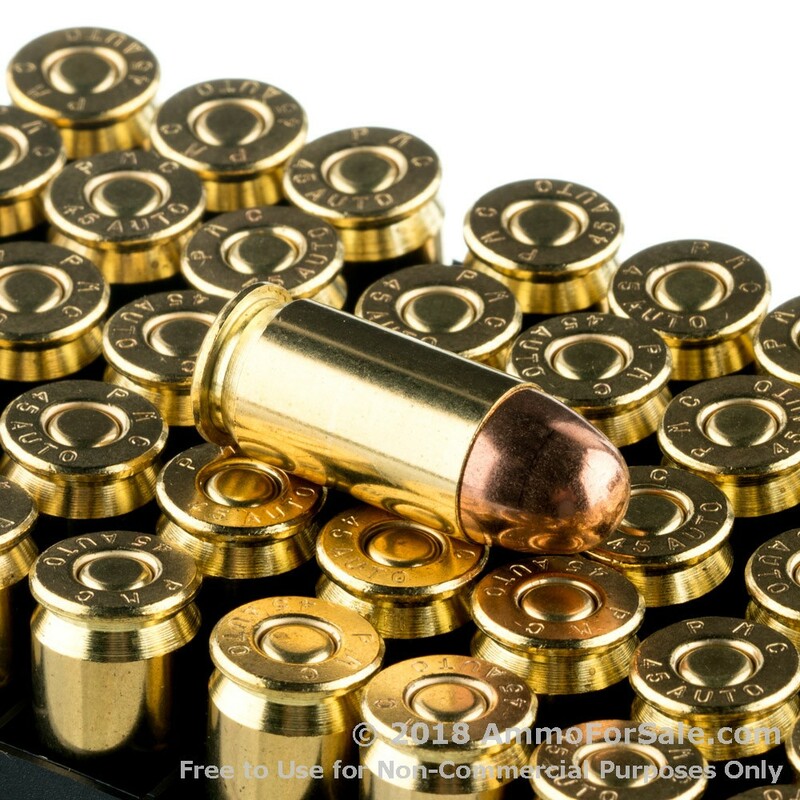 This ammunition is designed for target practice, self-defense training, and plinking. 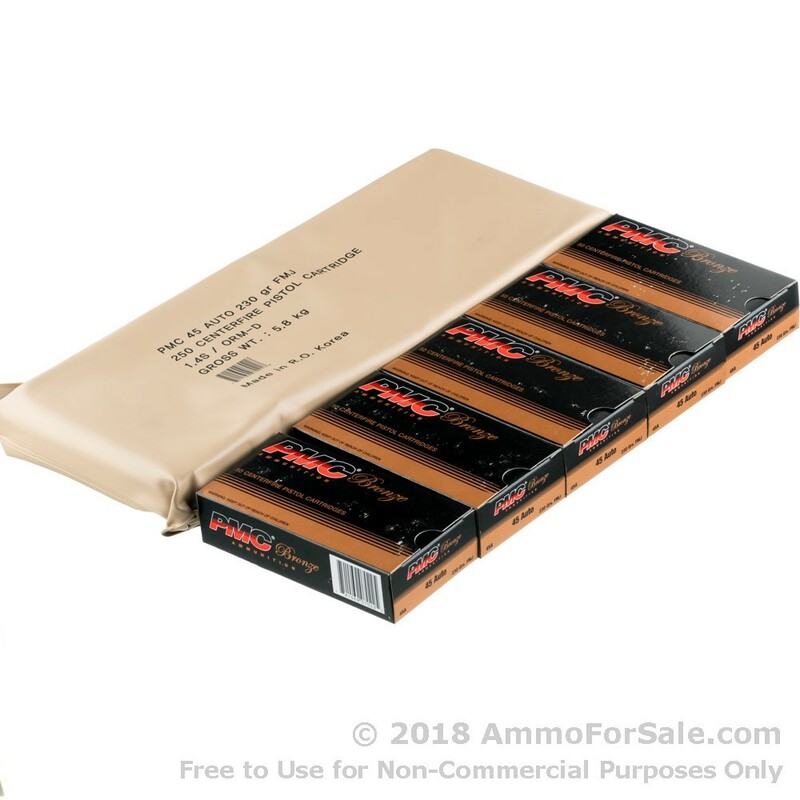 When you order this box of ammunition from PMC you get 250 target rounds: 5 boxes of 50 rounds each. With 250 rounds you can spend time working on accuracy and shot placement and still have enough ammo left to knock down some empty soda cans and water jugs. Even better, because these are produced in virgin brass cases with boxer primer you can collect your spent casings and reload them. Each round produces a muzzle velocity of 830 feet per second and muzzle energy of 352 foot-pounds. PMC manufactures ammunition at their factories in Angang and Dongrae, South Korea. Your .45 ACP is hungry, so feed it. Order now.